Melva Tabetha Ulsaker, passed away peacefully on May 14, 2018, surrounded by family at the age of 83. She was born Melva Tabetha Alleman on November 25th, 1934, in Americus, Kansas to Lloyd and Harriet (Packard) Alleman. Melva was united in marriage to Samuel D. Ulsaker on April 9, 1955, in Angola, Indiana. 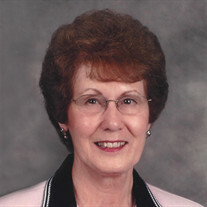 She was a member of the McPherson Free Methodist Church. She is survived by: her husband, Samuel Ulsaker of the home; children, Sherri Horun of McPherson, Kansas, Scott Ulsaker (Angie) of Kingfisher, Oklahoma, Tammy Wenthe (Rich) of Charleston, South Carolina, Todd Ulsaker (Mary) of McPherson, Kansas, Melissa Esselman (Alex) of Kansas City, Kansas; sister, Reva Pyle of Wichita, Kansas; ten grandchildren; 14 great-grandchildren; and one niece. She was preceded in death by her parents, Lloyd and Harriet Alleman, grandson, Stefan Ulsaker, and granddaughter, Tabetha. Family will receive friends from 6:00 PM to 8:00 PM, Thursday, May 17, 2018, at Stockham Family Funeral Home. A memorial service will be held at 11:00 AM, Friday, May 18, at McPherson Free Methodist Church with Rev. Tom Griffith and Rev. Tom Mayse officiating. A private graveside service will be held at McPherson Cemetery. Memorial donations may be given to McPherson Free Methodist Church or Hospice & Homecare of Reno County in care of Stockham Family Funeral Home, 205 North Chestnut, McPherson, KS 67460.